The Trisonic Support Bearer can be used as a component in a Danskin Saddle System where enhanced impact sound performance is required. It is substituted for softwood support bearers in the saddles and the resilient layer within the bearer provides additional cushioning to the walking surface in order to reduce impact sound transmission. The Danskin Saddle System incorporating Trisonic Support Bearers is ideal for the refurbishment of timber joisted floors where the floor requires a significant amount of levelling. 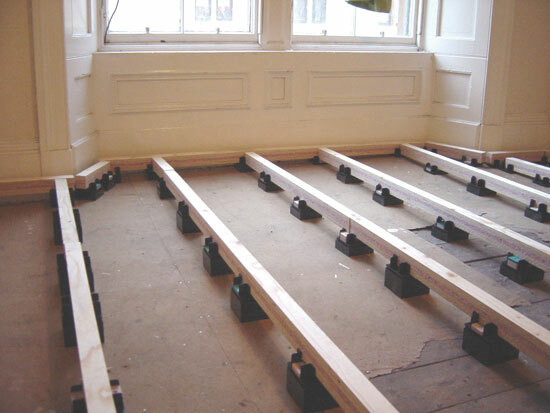 Tenement refurbishments and factory conversions are typical examples of existing timber floors which need impact sound improvement and levelling of up to 150mm. 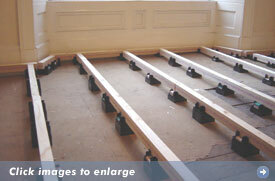 A suitable resilient ceiling is usually necessary on the underside of the joists. The Danskin Trisonic Support Bearer is a composite bearer comprising two layers of 22mm thick engineered plywood with a 12mm thick layer of rebonded foam glued in between. It is only used as part of a Saddle System and can be levelled up within the saddles using Danskin’s patented packing system in the usual way. By having the resilient layer in the middle of the support bearer it does not point load when it sits in the saddle plate and the flooring surface can be securely fixed to the top of the Support Bearer using screws and glue. The standard size of the Trisonic Support Bearer is 56mm high x 45mm wide x 2340mm long. For domestic loadings (UDL of 1.5kN/m2 and Concentrated load of 1.4kN) the recommended centres for saddles supporting the Trisonic Support Bearer are 390mm. Bearer centres are dependent on the type and thickness of flooring board. Flooring panels should be glued and screwed to Trisonic Support Bearers using a continuous fillet of PVA (or other suitable adhesive) and 35mm long screws. It is important that screws do not pierce the resilient layer in the middle of the Bearer. It is an essential feature of effective floating floors that they deflect vertically in order to absorb impact energy and therefore reduce sound transmission. However, excessive deflection under areas of high load such as kitchen and bathroom furniture is not desirable. 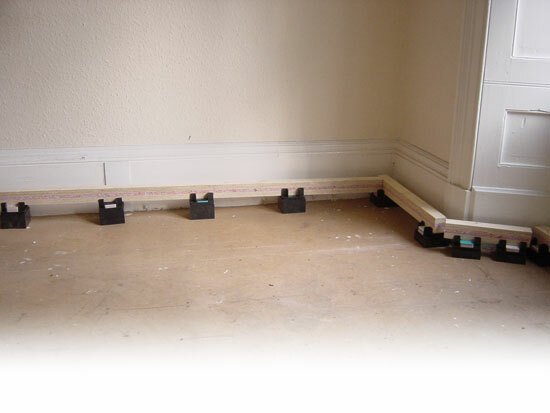 In such isolated locations a solid timber support bearer 52mm high can be supplied and packed up to the required level to provide more robust support where desired.